Towards the end of this evening’s Skype tutorial an interesting thread developed which explored the ideas put forward by Thomas et al. (in Transliteracy: Crossing divides, 2007) that in the story of humankind, reading and writing have been the dominant literacies for only a fraction of our existence. Prior to communicating through writing and reading, our predecessors would have communicated through physical expression, visual representation and oral storytelling. Elsewhere in the tutorial meanwhile, a second thread was simultaneously developing that focused on visual culture, and reflected on this week’s readings by Kress (2005) and Carpenter (2009). As the two threads merged, an interesting idea developed about presenting digital artefacts. Matt, the EDC Cartoonist-in-residence suggested the idea of telling a story entirely through emoticons. I responded with a suggestion of creating digital cave paintings. With some encouragement (some would say goading) from the rest of the group, a virtual gauntlet was thrown to the floor and Mark and I decided to retire to our respective digital studios and set about our work in competition. Here then, is my visualisation of a digital cave painting. I’ll try to interpret at least a little of what might be conveyed by this ingenious cave (visual) artefact. Firstly, interesting that both you and Mark have placed the Apple logo as a central theme – does this indicate how much influence Mr. Jobs et al have over our lives, or more simply that we all have apple (or similar) products. Perhaps also, Apple is more recognisable than Microsoft? The tribesmen/people bring back memories of Bendito’s Machine, with reference to a higher power, or perhaps there is celebration, perhaps that the group have acquired technology which they crave. And where would we be without twitter (and wi-fi – which my laptop seems to pick up intermittently!)? Hello Martin, that’s a pretty accurate reading of what I intended to portray. - the wild animals are pointedly ignoring the act of worship that’s going on. They’re underwhelmed by humankind’s latest fixation – they’ve seen this all before, going back thousands of years…all the way back to the time of the cavemen in fact. This is great; I love that the RSS logo is the sun! 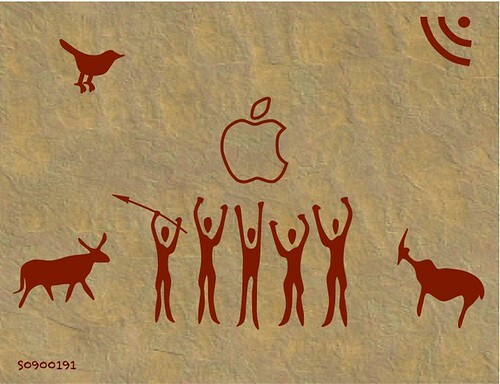 James, I’d buy a T-shirt with your digital cave painting in a flash! Definitely a winner. James, I went for the Mac logo for a sort of expulsion from Eden theme (analogue to digital ?). Over on the left of my original image I also had a serpent slithering down the cover of a book following the left to right, top to bottom convention of Western writing. I really do prefer your image to mine however as I agree with Charmaine in that it would make a fantastic T-shirt logo. I also love the concept of using either a wifi or RSS feed logo as a facilitator of growth !